Booktime, the free books programme from Pearson plc in association with Booktrust, gave its six millionth free book at the 2011 launch in London. Booktime, the free books programme from Pearson plc in association with independent charity Booktrust, gave its six millionth book away at the launch of this year's programme. Booktime provides a free book pack to every child starting primary school in England, encouraging adults to read with their children and share books at home. (3BL Media / theCSRfeed) November 21, 2011 - A lucky 5 year-old child received the six millionth book given at this year's launch of Booktime, the annual free books programme from Pearson plc in association with Booktrust for children starting school in England. 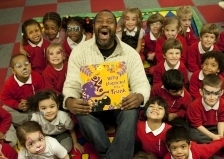 Comedian, actor and all-round national treasure Lenny Henry - the voice of Elephant in the Tinga Tinga Tales series on television - joined us for a colourful and noisy launch at London's Holborn Children's Library. The morning was filled with drumming, face painting and a lively reading from Lenny Henry to children in their first year of school at neighbouring primary school St George the Martyr. This autumn, Booktime is giving 1.38 million books to over 17,000 primary schools across the country, with every 4-5 year old child receiving a special Booktime edition of Puffin's Why Elephant Has a Trunk from the Tinga Tinga Tales® series created by Claudia Lloyd, and Pearson Primary's Face Painting (Rigby Star series) by Monica Hughes. This is the first time that we've put a Pearson UK book in the pack with the Puffin storybook, underlining Booktime's emphasis on both sharing books for pleasure and making learning to read fun too. It's now six years since the Financial Times' volunteer reading programme in Southwark schools inspired us to create the Booktime Reading Partners scheme for Pearson people across our other UK businesses - since then, we've had an average of 179 Pearson people across six offices spending 3411 hours each year to read with children in local primary schools. Studies continue to show that reading at home with young children can have a real impact on their future academic achievement, as this OECD PISA paper explains. Research carried out for this year's Booktime programme also found that 72% of teachers attributed developed language skills and more advanced reading levels to those children who regularly read with adults at home. Click here to read the full Booktime press release and here to watch a video about Booktime. Learn more about Booktime at www.booktime.org.uk. You can also keep up to date by following Booktime on Twitter here and Facebook here. Booktime is run by Booktrust, the independent charity dedicated to inspiring a lifelong love of books for all, and Pearson, the world’s leading learning company. The programme was launched in 2006 by Pearson in partnership with Booktrust. Booktime aims to promote the pleasure of books by encouraging families to have fun reading together. The programme supports, encourages and enables reading for pleasure in the home at an important transition stage in a child’s learning and development. Book packs have included titles from a long list of much-loved children’s writers and illustrators: Lynley Dodd, Janet and Allan Ahlberg, Ian Whybrow, Adrian Reynolds, June Crebbin, Ed Vere, Geraldine Taylor, Amy Schimler, and Eric Carle. This year’s story book is Why Elephant has a Trunk (Puffin), from the Tinga Tinga Tales series created by Claudia Lloyd. Why Elephant has a Trunk is a lively, laugh-filled story ideal to read aloud. Families will discover the fable of how Elephant got his trunk in a mishap with a very snappy crocodile and find out how he puts his new nose to great use. Its vibrant illustrations inspired by the Tingatinga artwork of Tanzania make Why Elephant has a Trunk an exciting and engaging title for families to enjoy reading together. For the first time, book packs also contain a title from Pearson UK, the education business. Face Painting (part of the Rigby Star series) is a non-fiction book to share, with colourful photos of children with their faces painted. There’s a design every child will enjoy, from a beautiful butterfly to a fearsome pirate and a scary monster. 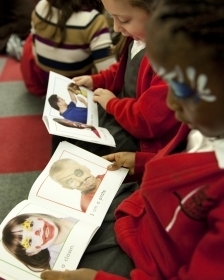 Face Painting, by Monica Hughes, lets children have a go at sharing a book with an adult by describing what they see and reading the words they know. Since the Booktime programme began, Pearson’s UK staff have been giving their time to read with children in local primary schools through our Booktime Volunteer Reading Scheme. For the academic year 2010 - 2011, 210 Pearson volunteers spent over 3,374 hours (the equivalent of 482 working days) reading with children.